When selecting a security professional, we suggest that you call their offices late at night or very early in the morning, 24-Hour Monitoring Centers Keep You Safe Around the Clock. A home security system is only as good as the people who monitor your alarm. If an alarm goes off, our team will immediately contact local authorities for a rapid response! Our monitoring is the industry gold standard. 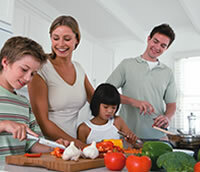 We Protect Your Family with the Latest Technology. Sterling Security Systems alarm monitoring centers provide protection around the clock, every day of the year. Our three state-of-the-art alarm monitoring centers are so sophisticated they automatically back each other up in times of duress—such as a hurricane or tornado. Alarm Monitoring You Can Depend On—No Matter What! There are two kinds of alarm systems—those that are professionally monitored, and stand-alone alarm devices that do not signal for help. Sterling Security Systems only sells, installs and services professionally monitored alarm systems because that is the only way we can deliver the help you need, when you need it. A system that is not monitored will not alert authorities—an alarm only sounds in your home. Contact us to show you how affordable our monitored home security system packages are, especially when enjoying peace of mind is your goal. Learn more about home security system packages. People Call Us Because They Need Us—Now! Unlike many other service companies, we walk the talk. Our call center takes great pride in having the fastest response times in the industry. If you call us, we don’t route you into an automated phone system. We answer your call fast, with an average call waiting time of under 10 seconds. Calling about an alarm and not being able to quickly speak to a human being about your issue is not a great feeling—and it’s dangerous. For the past 3 decades, we have been serving throughout the area with an unsurpassed commitment to customer service and satisfaction! As a local Connecticut company, we bring a personal touch to the high-tech world of electronic security. With our state of the art 24-hour Central Monitoring Center, we can dispatch the authorities and quickly respond to signals such as Intrusion Alarms, Hold-Up Alarms, Fire Alarms, High or Low Temperature Alerts, Water Leakage Alerts, Dangerous Gas Alerts, Loss of Electrical Power and Critical Equipment Failures. From our local Service Center, we monitor your home or business 24 hours a day so you won't have to! when selecting a security professional, that you call their offices late at night or very early in the morning, and see how your call is handled. Would you be comfortable with this response if you had an emergency and needed immediate assistance? Most alarm systems are connected to a central station facility via ordinary telephone lines. Burglars are more educated than ever, causing a disturbing increase in the number of alarm system communicators rendered "voiceless" by the simple cut of a phone line; so much so, in fact, that some police departments have begun to send letters to residents and business owners warning of this escalating threat. If you're in need of a security solution for your business or commercial property, then you're in need of Sterling Security Systems!!! We are an authorized Bosch and DMP Systems dealer. We can integrate the latest technologies for intrusion alarms, fire alarms, card access control systems, and Digital Video surveillance systems all into one easy-to-use software platform. Imagine controlling all of your security needs with the touch of a button or click of the mouse! Our digital video systems can be viewed remotely, a tremendous tool for any business owner or manager who has to monitor employees, facilities, assets, or operations. All that, and our local monitoring service, which can provide you with the early warnings of problems such as temperature, loss of power to critical equipment, coolers or freezers that are outside of their required temperature range, and even other security technologies for your business. Sterling Security Systems(c). All rights reserved.